Nick Lowe is a master artist - vocalist, musician, producer, tastemaker - one of the truly class acts in music. But nowhere does this British gentleman shine more than as a songwriter. Lowe consistently displays a great sense of melody, impeccable song structure, hooks galore, featuring clever wordplay to embellish a terrific story, a memorable character or a unique way of looking at a situation. This CD Lowe Country - The Songs of Nick Lowe puts 13 songs in the hands of some of today's finest Americana singers with a focus on the more country side of Lowe's catalogue, or giving a more country arrangement to some of his better known rock songs -- "I Love the Sound of Breaking Glass" (Amanda Shires), "Marie Provost" (JEFF the Brotherhood), "Heart of the City" (Chatham County Line). Hayes Carll's "(I'm Gonna) Start Livin' Again If It Kills Me". Longtime WYMA favorites The Parson Red Heads version of "Don't Lose Your Grip on Love". One of my very favorite singers, Canadian Ron Sexsmith's "Where's My Everything". Caitlin Rose doing "Lately I've Let Things Slide", here. Purchase here: Music Millennium or at better independent record stores everywhere, especially in your town. 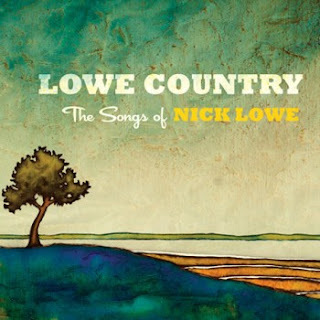 Lowe Country is a terrific collection of cover songs. Highly recommended. Chicago's Pear Traps are a very good lo-fi guitar rock band - we've featured them before and are delighted to do so again. Ridiculously, they are willing to let you have it for "name your price". If you like it, download it and pay 'em something... and stay tuned. Hopefully they'll have another full-length soon. The re-election of President Obama was a monumental event this week. The reasons behind the historic win be analyzed, dissected, and written about in articles, book, dissertations and treatises for many years. But one key fact may be overlooked - President Obama's events featured much better music! In fact, his victory party on Tuesday sounded like it was sponsored by the Soul Corner, especially when the President entered the hall to King Floyd's "Groove Me". But the song that took center stage with the President at the height of the celebration certainly deserved the honor. Stevie Wonder's "Signed, Sealed and Delivered" is an American classic by one of our most gifted and essential artists of all time. The song, released in 1970, was the first that Wonder self-produced and also his first ever nominated for a Grammy award. How's this for political trivia: it is also reported to be the ringtone on David Axelrod's cell phone when the President calls his senior advisor. Indie-folk encompasses a broad range of musical styles, from quiet and gentle to loud and energetic, sincere to sly, sad to humorous. Murmuration, the first LP from Glasgow indie-folk artist Jo Mango in six years, arrives like a whisper on the sea breeze. The pure tone of her vocals barely audible over the minimal arrangements, the phrasing deliberate and seemingly directed inward. The listener has the sense that he is being permitted to overhear a musical diary. And it is beautiful. Jo wasn't idle in between albums. She obtained her doctorate in musicology and collaborated with numerous other artists. The first single from the album is "Cordelia", which is available at this link for "name your price". The songwriting on Murmuration is excellent, but the things that stand out the most for this listener are the quality of Jo's vocals, and the tasteful restraint in the arrangements. With respect to the former, the vocals are note-perfect and phrased to allow the words to sink in. With respect to the latter, while this set of songs leave enough aural space to invite an artist and producer to experiment and gild, thankfully, they resist the urge and craft details in way that seem to be nothing less than essential. And it may be this attribute of the album that pushes it ahead of many of the offerings available in indie-folk. Murmeration is out now on Scotland's fine Olive Grove Records. 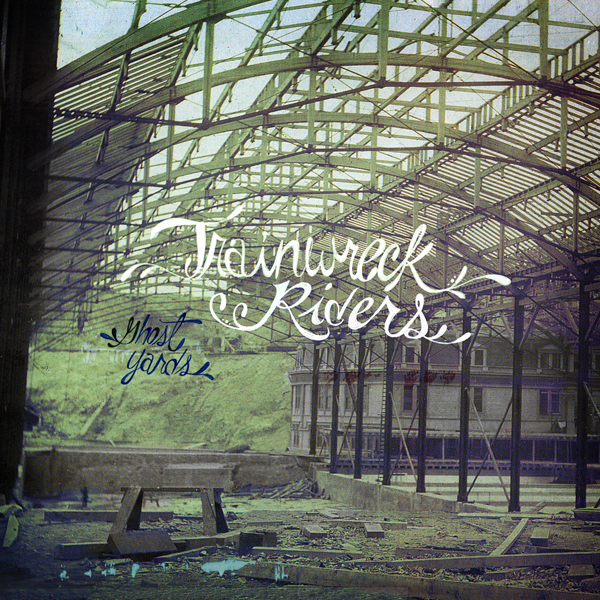 Trainwreck Riders are a San Francisco band playing a fantastic blend of alternative country and alternative rock - bringing to mind influences as varied as The Meat Puppets, Drive-by Truckers and Pavement, in the process of creating something very enjoyable. Apparently all four members, rhythm guitarist/vocalist Pete Frauenfelder, drummer Steve Kerwin, lead guitarist/vocalist Andrew Kerwin, and bassist Shawn "Boof" Wyman, share backgrounds playing in various punk bands. Like some of the better alt/country acts, the punk influence is not terribly overt but definitely informs their approach, and yet does not limit their willingness to stretch out and play some guitars. Somewhat typical of the album as a whole, the song changes three times - each includes some terrific rhythm and guitar work. This is my first exposure to this band - apparently they've been playing together for 10 years or so - and I look forward to exploring the back catalog. For now, you'd be well advised to give this thing a listen. Today's news is the first official US release from Ireland's September Girls. Out soon on Matinee Recordings, the Wanting More 7" features the title track A-side and two B-sides. These ladies have graced our pages before, and I expect that they will continue to do so. Their music is excellent, and the vinyl versions always sell out (their April release for Scotland's Soft Power sold out in a week), but this record is available in both vinyl (with a digital download included) and digital-only. "Wanting More" may cause you vinyl purchasers to wear out the A-side -- girl-group vocals soaring on a retro melody, all swathed in reverb and distortion. The Ronettes never fronted The Jesus and Mary Chain in a recording produced by Phil Spector, but this might give you an idea of what it would have sounded like if they had. 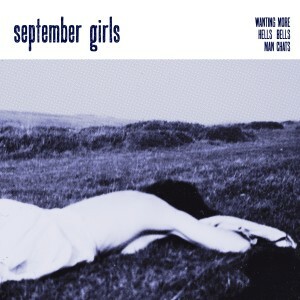 September Girls - Hells Bells from jessie ward on Vimeo. Someone cleverer than I one described the sound of this five-piece as that of a transistor radio abandoned in a rural cinema. After listening to several releases, I think it is a fair and evocative description. In the second B-Side, September Girls showcase their ability to deliver the noise. This isn't a sweet collection of female singers, this is a rock band. We look forward to more from Sarah, Lauren, Jessie, Caoimhe, and Paula.